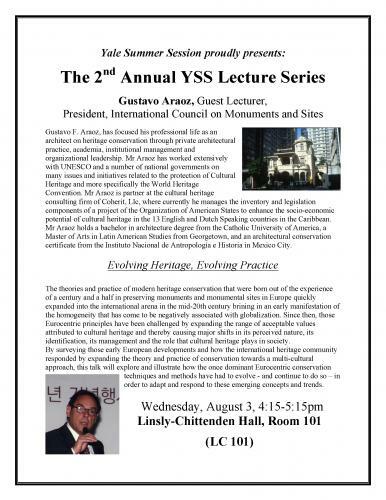 On Wednesday, August 3rd, Gustavo Araoz President of the International Council on Monuments and Sites (ICOMOS) will give a lecture in Linsly-Chittenden Hall at 4:15 PM. Attendance is open to the public. The theories and practice of modern heritage conservation that were born out of the experience of a century and a half in preserving monuments and monumental sites in Europe quickly expanded into the international arena in the mid 20th century brining in an early manifestation of the homogeneity that has come to be negatively associated with globalization. Since then, those Eurocentric principles have been challenged by expanding the range of acceptable values attributed to cultural heritage and thereby causing major shifts in its perceived nature, its identification, its management and the role that cultural heritage plays in society. By surveying those early European developments and how the international heritage community responded by expanding the theory and practice of conservation towards a multi-cultural approach, this talk will explore and illustrate how the once dominant Eurocentric conservation techniques and methods have had to evolve - and continue to do so – in order to adapt and respond to these emerging concepts and trends. Gustavo F Araoz, has focused his professional life as an architect on heritage conservation through private architectural practice, academia, institutional management and organizational leadership. From 1995 to 2009, he was Executive Director of US/ICOMOS. After serving two terms as Vice President of ICOMOS, he was elected its President in 2008, 2011 and 2014. From his position in ICOMOS, Mr Araoz has worked extensively with UNESCO and a number of national governments on many issues and initiatives related to the protection of Cultural Heritage and more specifically the World Heritage Convention. A frequent international lecturer, Mr Araoz was in charge of the conservation studio of the University of Pennsylvania Graduate Program in Historic Preservation for six years. He has also taught at the University of Maryland and was a guest lecturer at the University of São Paulo. He serves on the Keeping It Modern Advisory Board of the Getty Foundation and in the 500 Program of the CyArk Foundation. He has also served on two selection panels of the World Monuments Watch and the Architectural Conservation Grants Program of the Getty Foundation. In 2006, he chaired the Panel on International Participation at the US Preserve America Summit convened by the White House. His private practice has included work on heritage properties and policy for private clients as well as the US National Park Service, the US Departments of State and of Defense, the Organization of American States, the University of Virginia, World Monuments Fund, the City of Buenos Aires, the Instituto de Cultura Puertorriqueña, the Panama Canal Authority and the Governments of Bhutan, El Salvador and Paraguay. Mr Araoz is partner at the cultural heritage consulting firm of Coherit, Llc, where currently he manages the inventory and legislation components of a project of the Organization of American States to enhance the socio-economic potential of cultural heritage in the 13 English and Dutch Speaking countries in the Caribbean. Mr Araoz holds a bachelor in architecture degree from the Catholic University of America, a Master of Arts in Latin American Studies from Georgetown, and an architectural conservation certificate from the Instituto Nacional de Antropología e Historia in Mexico City.